So many fun things to do with the kids this weekend! Make some beautiful art, print your own shirt, play and learn at the early literacy fair, practice yoga, learn about dinosaurs, watch a movie in the park, enjoy aerial dance performances, learn about space, and so much more. All happening this weekend in and around Boulder! Firefly Handmade Market, presents favorite and emerging artisans with home goods & décor; jewelry & accessories; adult & children’s fashion; skin care; ceramics; art; artisanal food; paper goods; and more. While the kids enjoy the kids’ art activities by Tinker Art Studio, parent will love checking out the 100+ indie artisans, artisan demos by Open Studios Artists, NoBo Art District community art tent, live music with Banshee Tree, food trucks, the Shutter Bus VW Photo Booth, and Junior & Teen Firefly presented by Tinker Art Studio. Dogs are welcome! Movies in the Park is a free family event open to the public at Broomfield Commons Park. Bring food, blankets, and lawn chairs for the events. Dogs are welcome with regular park rules in mind (leashes, cleaning up, large crowd, etc.). Finding Dory will begin around dusk. Attendees are encouraged to arrive early beginning at 7:00 PM to participate in games and activities before the movie. Movies in the Park is sponsored by Blue Federal Credit Union, Broomfield FISH and F.R.I.E.N.D.S of Broomfield who will be at the movies providing special goodies and extra fun! 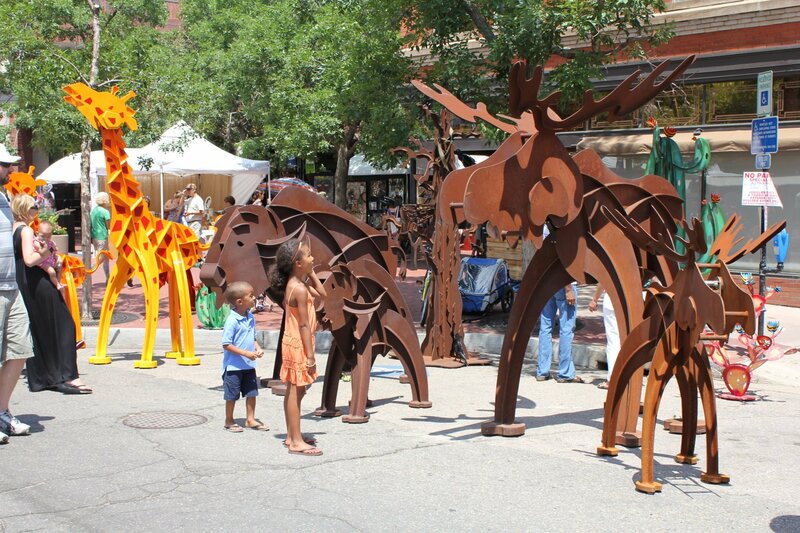 Pearl Street Arts Fest is a juried celebration of visual arts celebrating photography, sculpture, upcycled art and much more. Event features artists from around the country; children’s art activities; live interactive performances – and much, much more! From 11AM – 1PM and 2PM – 4PM watch and learn the magic of Aerial Dance from Boulder’s own Frequent Flyers featuring live aerial dance performances will be interspersed with opportunities for the audience to give it a try. Open Studios Mobile Art Lab will be on hand to host a student-centered, discovery learning approach that nurtures self expression, creative thinking and develops a lifelong love of art. For kids and adults alike! Our friends at Goodbye Blue Monday will help you and your child print your very own T-shirts at their portable T-shirt printing booth! Paint on the design, send your shirt through the oven, and take home your own custom apparel from this cool do-it-yourself experience. Play & learn with your kids at the Early Literacy Fair! Fun, interactive early literacy stations: bridge building, cars & ramps, building & destroying toothpick structures, a play restaurant, social & emotional literacy activities with Bal Swan Children’s Center, fun crafts, activities for babies at each station & more. Incluye actividades en Español. Cost: Adults, $10, Kids $7 Tickets available here. Head over to Fiske Planetarium to view “We Are Stars” narrated by Andy Serkis seeks to answer some of the biggest questions of all time. What are we made of? Where did it all come from? Explore the secrets of our cosmic chemistry, our explosive origins and connect life on Earth to the evolution of the Universe. A family-friendly film full of fun, adventure, and enlightenment in amazing 8K resolution! In partnership with Daily Camera and City of Boulder Colorado Government, The Hill are hosting Summer Sundays on The Hill all summer long! Every Sunday in June and July from 9AM – 12PM, 13th Street will be closed to host free outdoor yoga and barre classes, as well as free just-for-kids-fun and community activities. Parking is FREE on Sundays, too! All activities are FREE. This week’s activities include: 9:00 a.m. Outdoor Barre class with The Dailey Method Boulder, 10:00-Noon Airbrushed Temporary Tattoos with The Root of the Hill. All Day: Paint and Watercolors with Meininger Art Supply, face-painting by Enchantment Etc., live music with Joshua Achorn, chalk and bubbles stations, hula hoops, yard games. Taste of The Hill runs from 10 AM – 12PM! Free bite size treats from participating businesses: 1000 Degrees Neapolitan, Pizzeria of Boulder, Ado’s Kitchen & Bar, Boss Lady Pizza, Café Aion, Cheba Hut Boulder, The Corner, Insomnia Cookies, Mami’s Authentic On The Hill, The Point Cafe Boulder, Roxie’s Tacos, Taco Junky & Tequila Bar, Upstart Kombucha, White Mountain Chaga. Bring your mat and enjoy a bendy, fun, relaxing, and body-affirming hour of yoga at Alchemy of Movement in Boulder! All abilities and flexibilities (gender, sexuality, limbs) are welcome. No mat? No worries. . . there will be mats available to use. Cost: Donation based, all proceeds benefit Out Boulder County. All inquires contact Out Boulder County.